Kaka may belong to Jesus, but Abby belongs to Rochester. While Mia Hamm, a few of the others of the 1991 USWNT World Cup squad, were bigger stars within the media, I wouldn't be surprised if Rochester's love for Abby was the same. But in this post-91ers WPS world of women's soccer, it is great to know that yesterday's crowd at Marina Auto Stadium was only topped by a handful of games in 2008 for domestic attendance. The best part of yesterday was that it was a picture perfect day for everyone involved. 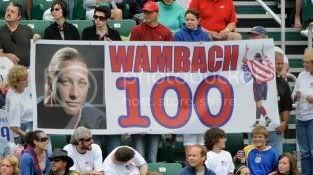 Abby was able to score her 100th international goal in front of her family, friends, and thousands of fans that came out to support her. But even if Abby hadn't scored yesterday, it would have been all right. For one year ago, when Abby suffered the injury that knocked her out of the Olympics, Rochester felt for her. Abby says everything happens for a reason. And yesterday, the fates had Lauren Cheney, the player that replaced Abby on the Olympic squad, saying thank you with a perfectly weighted through ball on the goal that everyone hoped would come. Now Rochester waits for Abby to return home when she's sitting on goal number 158 and is hoping that the fates will smile on her at least one more time. - US Soccer.com had a cool video with Abby and Christine Sinclair about what they have in common and then there was the blog post about the BBQ at the Wambach house. - Devo has a blog post of why Tim Melia was subbed out on Saturday and the update after training today. - Speaking of injuries ahead of tomorrow's Open Cup semifinal, Steven Goff has some news as Clyde Simms is out for DC, Dejan Jakovic will rest, and Danny Szetela is still awaiting paperwork to be eligible. - If you want to do some scouting, here are the highlights of DC's win over Colorado from Saturday night. - And if you want to be on MTV's The Real World, maybe you should make the trip tomorrow. - Could this be Ben Olsen's final season in MLS? - Is Portland a baseball town or a soccer town? Why can't they be both? - It looks like bigger teams than the Rhinos might need to get a little creative to sell stadium naming rights. - I love this take on the atmosphere at a dry BMO Field. - Two strikes and Sandro Grande is out in Montreal. - Can it be? Not one, but two articles that are positive about the future of soccer and MLS? - It looks like Chelsea and Tottenham are lining up to help Beckham prepare for a run at a roster spot on England's 2010 World Cup squad. - This time it's Fanhouse.com with a Grant Wahl interview. - Steve Davis isn't buying what Beckham is selling. - But the best part may be the rise that the LA Riot Squad got out of Beckham during their friendly with AC Milan. No Short Corners , SBI.net , MLS Daily, MLSNet.com, and The Daily Breeze all have some good stuff from the match. I wonder what MLS will do if Beckham taunts fans during a league match like that?